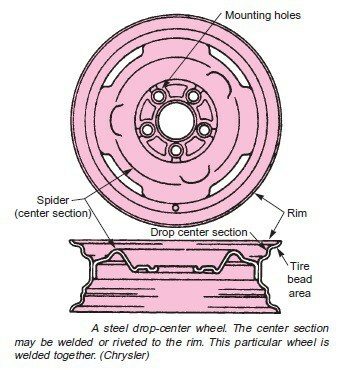 The following article cover the components related to a vehicle’s wheels. These components, which include the wheel hubs, bearings, rims, tires, and fasteners, are found on both driving and non-driving axles. lubricant in and dirt and water out. Wheel bearings must be carefully selected to deal with types of loads, maximum bearing speed, where the bearing will be used on the vehicle, and what the vehicle is used for. Overall bearing size, as well as the size of the rolling elements, must be determined to give the longest service without unnecessary weight and size. The flange holds the tire in place once it is installed and inflated. Steel rims are relatively light and reduce the amount of unsprung weight. They are also durable and cheap to manufacture. Some steel rims are chrome plated for appearance, while others are painted and used with wheel covers. Modern vehicles are increasingly using rims made of materials other than steel. These rims are usually called custom rims. Common materials for custom rims are aluminum, aluminum-magnesium alloys, and composites of graphite and plastic. Tires perform two jobs: they cushion shocks and provide traction. In their role as cushioning devices, they can be considered part of the suspension system. As traction devices, they transmit engine power, as well as braking and turning efforts, to the road. The external parts of the tire are the tread and the sidewalls. Tread designs vary depending on the tire’s application. The sidewalls form the support for the treads. The tread and sidewalls are a blend of natural rubber and a synthetic rubber called neoprene. The internal parts of the tires are composed of plies and belts. The plies are layers of tire cord that form the general shape of the tire. Tire cords can be made of various fabric materials, including nylon, rayon, polyester, aramid, Kevlar, or fiberglass. The belts are installed directly under the tread and can be made of the same materials as the plies. Some belts are made of steel. An important factor in wheel and tire design is the way the rim is mounted to the hub or axle flange. On almost all cars and trucks, the hub or axle flange contains the wheel studs. Most wheel studs are threaded bolts or studs pressed into the hub or flange. A knurled area on the rear section of the stud cuts into the hub or axle metal to keep the stud from loosening. The head of the stud resembles a bolt head and is wider than the hole in the hub or flange. The head keeps the stud from coming completely through the hole. To precisely center the wheel, a central part of the hub or flange is slightly raised and holds the center of the rim in position. To install the wheel, the holes in the center section of the rim are placed over the studs and lug nuts are threaded. onto the studs. The lug nuts can then be tightened in a cross or star pattern. The tapered end of each lug nut matches a tapered area in the wheel mounting hole. The matching tapers help center the wheel. On most steel wheels, the lug nuts can be tightened by hand or with an impact wrench. Custom wheels have different metal expansion rates than the steel and iron hubs, and the lug nuts must be tightened to a specific torque. A few imported vehicles use a somewhat different design. Instead of studs, the hub or flange has threaded holes. Tapered lug bolts are installed through the wheel and threaded into the holes. As with lug nuts, tightening is very important.